We will analyze various flavors of TCP, such as Reno, New Reno, Vegas to identify which of these are best suited, in their current standardized implementations, to meet the challenges of dynamic spectrum access. This will yield comprehensive insights on the best practices for future transport layer design. We will explore the extent of cross-layer information, such as knowledge of when, where and for how long a primary user (PU) affects the connection, on typical window-based congestion control methods, such as the additive-increase-multiplicative-decrease mechanism in TCP. This will advance the science of effectively integrating and prioritizing information from the lower-layers and other nodes in the chain, whenever obtaining this information is feasible. We will research new directions on equation-based congestion control for CR, which breaks free from the self-clocking mechanism of TCP, and allows for near-instantaneous response to changing spectrum conditions. R. Doost-Mohammady, M. Y. Naderi, and K. R. Chowdhury, “Performance Analysis of CSMA/CA based Medium Access in Full-Duplex Wireless Communications,” IEEE Transactions on Mobile Computing, vol. 15, no. 6, Jun. 2016. Y. 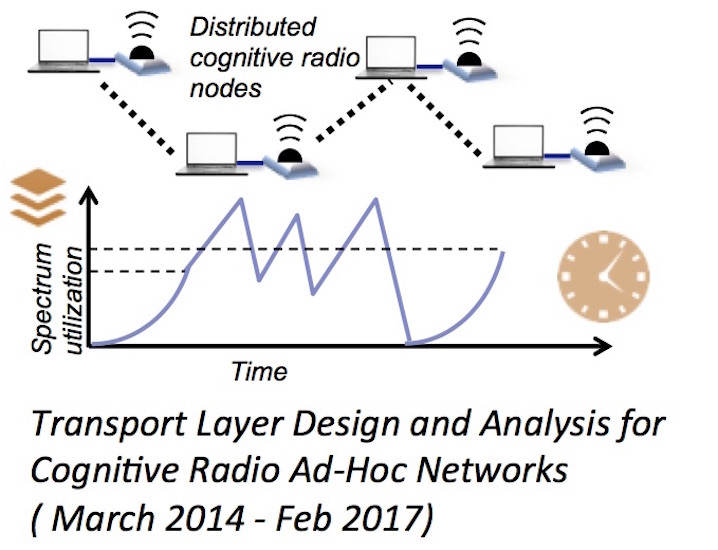 Sun and K. R. Chowdhury, “Enabling Emergency Communication through Cognitive Radio Vehicular Network,” IEEE Communications, vol. 52, no. 10, Oct. 2014. W. Lei, F. Zhou, W. Meleis, and K. R. Chowdhury, “Learning-based and Data-driven TCP Design for Memory-constrained IoT,” IEEE DCOSS, Washington D.C., 2016. F. Zhou, K. R. Chowdhury and D. Choffnes, “Janus: Network and Application-aware Multi-TCP Optimization Engine,” IEEE INFOCOM, Poster Session, San Francisco, CA, USA, Apr. 2016. F. Zhou, A. Al-Ali and K. R Chowdhury, “TCP Protocols in Dynamically Varying Bandwidth Conditions,” CROWNCOM, Doha, Qatar, April 2015. A. Al-Ali and K. R. Chowdhury, “Simulating Dynamic Spectrum Access using ns-3 for Wireless Networks in Smart Environments,” IEEE SECON Workshop on Self-Organizing Wireless Access Networks for Smart City, Singapore, June 2014.